The priesthood put pressure on the Soka Gakkai with the secret aim of disbanding it as a religious organization. Corrupt, evil individuals, including a treacherous Gakkai attorney, had suggested this to them. Whether or not the Soka Gakkai’s leaders knew it at the time, they had allowed themselves to become entrapped by the nefarious strategies of the priests and members who had renounced their faith and betrayed the organization. It was pitiful. I was completely at a loss for words. Mr. Toda had told us all: “Protect the third president! Protect him as long as you live! If you do so, you will definitely be able to achieve kosen-rufu!” Had the top leaders of the Soka Gakkai forgotten the spirit of their beloved mentor? How pathetically they had let themselves be defeated! Where was the Gakkai spirit that they should have allowed themselves to be so overcome by circumstances? 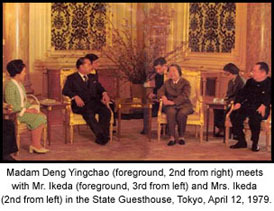 In the midst of all this, on April 12, I met Madame Deng Yingchao, the widow of Chinese Premier Zhou Enlai, at the State Guesthouse in Tokyo. As we parted, I told her that I had decided to resign. “You mustn’t!” she said, the smiling face of this great mother of the people suddenly growing stern. “You are too young to resign. Above all, you have the support of the people. As long as you have their support, you must not resign. You must not retreat even a single step!” Those were the resolute words of a person who had lived through death-defying challenges and danger. That dark day, April 24, arrived. It was a Tuesday. Representative leaders from all over Japan had joyfully gathered at the Shinjuku Culture Center. But what should have been a momentous meeting marking a fresh departure and the end of the first Seven Bells — seven seven-year periods of the Gakkai’s development from its founding in 1930 — became instead the announcement of my resignation and the appointment of a new president. This is a poem I recorded in my diary that day, April 24. When I got home and told my wife that I had resigned, she greeted me with a smile, just as she always did, without asking a single question. With her usual, imperturbable composure, she said: "Is that so? Thank you for all your hard work."